Who’s using Rehab Software Pro? Below are a couple testimonial we’ve recently received. Rehab Software Pro – A list of ALL our major competitors! Why would we do this? Firstly we believe that you should make an ‘informed’ decision when looking at which rehab software system you are going to use. So, we thought we would be helpful and make it easy for you by putting the infomation all in one place! Secondly we believe that as Rehab Software Pro is the quickest, easiest and most competitively priced program available, once you’ve had a look at our ‘competitors’ you’ll make the decision to sign up with us. 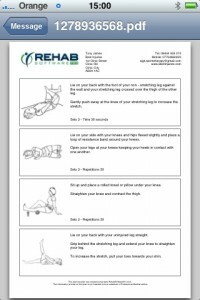 Before you check out the list make sure you go to the Rehab Software Pro website and sign up for our ‘instant free trial‘. 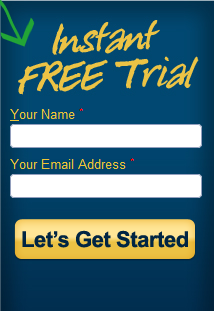 Enter your name and email address and try out our FREE trial right away. Want to Know more about Rehab Software Pro? Then check out the video’s below. Video 1 – Slide Show… all the main benefits. Video 2 – Video tour… see how you can create programs quickly and easily. One of the major benefits of Rehab Software Pro being run as an ‘online software application’ is that the updates we make to the system benefit EVERYONE. This includes all ‘users’ no matter what package you have signed up to (monthly, yearly or lifetime). As soon as we make changes every account is updated with ALL the new features, at no extra cost to you. The same can not be said for many of our competitors. This is because many of them still deliver their programs in CD format. This means that once they’ve ‘burnt’ a CD with the currrent version of the software the only way for you to get an update is to buy the latest version. With that in mind I’m sure you will appreciate the advantage of Rehab Software Pro being delivered online, always allowing you instant access to the most up to date version of the software. This is a hugely important additional feature will be added to the programme in the near future. It will allow you to edit the ‘stock’ descriptions that are already built into the system and customise the wording in your plans to ‘sound’ more like you, using your own terminology. Currently the library of exercises is at just over 500. We will be adding additional illustrations to the system on an ongoing basis. Many of the additional new exercise updates will be based on the feedback we receive form our customers (thats you!). The next planned illustrations that we will be adding will focus on ‘gym based’ exercises with equipment including dumbbell and barbells. Over the next couple of weeks we will be making a few changes to the design and internal lay out of the site. These changes will be subtle but will make the software ‘look better’ and more importantly make it easier and logical for you to use. On top of all the other ‘larger’ updates we are constantly making a number of minor changes to the software, in an effort to make the system more intuitive and faster to use. If you have have any suggestions that you believe will improve the software and make the system easier for you and others to use please email me directly at alex(at)rehabsoftwarepro(dot)com. Over the last few weeks we’ve been asked a number of times how we create the beautifully clear illustrations used on the website. Your patients can now view their exercise plans from anywhere on their smart phones. 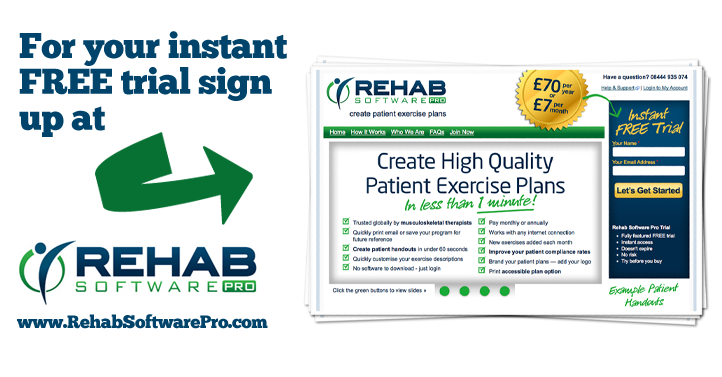 Using Rehab Software Pro your clients plans can be emailed directly to their inbox’s. The plans are delivered in pdf format which allows your patients to open up their customised plans on their own smart phone! Your clients can now view their programs from anywhere 24 hour a day. This eliminates all of those old excuses that your patients use for not completing their exercises, like “I couldn’t remember how many to do” or “I wasn’t sure if I was meant to do them with my leg turned out?”. Send their plans using the software and the information will be available to them where ever they are – whenever they need it. Great hey! Those of you that run your own private practice or are self employed will realise marketing your services can be very expensive. I know my own costs run into several hundreds per month. I had an experience last week that made me aware of how exercise plans are a great marketing tool for your clinic. In the run up to launching Rehab Software Pro, while testing it, I have been using the program a HUGE amount with my own clients. However it is only recently that Nick (the software developer for Rehab Software Pro) showed me how well the programs display on different smartphones. Once I realised this I started asking all of my patients if they had a Blackberry or iPhone. The ones that said “yes” I re-sent them their plans and explained to them that they could view their plans on there phone. It was only last week that I realised how this can generate extra referrals. One client received his new plan on his iPhone while he was at work. He was so blown away by the fact that he had his plan on his phone that he went round his office showing his work colleges! One of his colleges was also really impressed and started asking a little bit about who was treating him. As it turned out this work college was also carrying an injury and had been meaning to book in with someone ‘for ages’. Well guess who got a phone call the following day? The ‘movers and shakers’ in the Physiotherapy world. Check out the list below of some of the most highly rated Physiotherapy and Sports Injuries clinics around the world. Awards: North West Physiotherapy has won the North West News Business Achievers Award for each of the last 3 years, culminating in them being awarded the Bronze Hall of Fame last year. 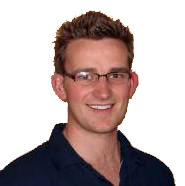 Owner/ Director/ : Roger McIntosh established North West Physiotherapy in 1996 after working as a senior physiotherapist in both the private and public sectors in Australia and the UK. Specialisation: North West Physiotherapy aim to demystify the physiotherapy process, getting each patient educated and involved using simple and easy to understand terminology and examples. Owner/ Director / Founder : Matt Todman and Rupert Crowfoot. Specialization: Six Physio have been providing expert diagnosis and treatment across London for over 15 years. Owner/ Director / Founder : Mark Saunders founded Physio4Life after joining the Army in the 1990’s where he worked closely with elite special forces the SAS. In 1994 returned back to university where he retrained as a physiotherapist. Initially Mark went to work in the NHS and then Professional Rugby, before returning to the Army to join RAMC (Royal Army Medical Corps) to be a physiotherapist working in the Army Sports Injuries and Rehab Clinics. Following 4 years in the Army medical services Mark left and did another short spell in the NHS. Here he realised the level of service was not what he had hoped and decided to open his very own sports injuries and health clinic with is own unique brand and unique selling points. Specialization: Physio4Life help individuals who suffer from chronic pain to sporting injuries, allowing them to become pain free and return to sport as well as normal daily life. Awards: The Physio Co was announced at No.19 on BRW’s list of Australia’s Great Places to Work in 2010. In 2009 The Physio Co was placed at No. 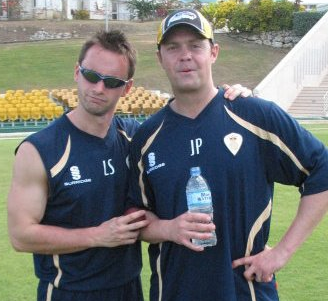 37, as per the literature on their own website The Physio Co “is clearly growing and building a culture of success”. 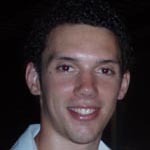 Owner/ Director / Founder : Founder Tristan White discovered that there are hundreds of thousands of Australian seniors that needed better physiotherapy services. He also identified that there were many health professionals not challenged or appreciated in their jobs. The Physio Co was born to fill a niche, provide a great service and bring together a team of talented and caring health professionals. Specialization: The Physio Co provide care for senior and elderly clients. Their aim being “to keep seniors moving”. Awards: Synergy was named Business of the Year 2008 at the Wansbeck Business Awards and was set up as a one-man business by Keith Fitzsimmons nine years ago. It now employs five full and part-time physiotherapists, plus an office administrator. Owner/ Director / Founder : Synergy was set up by Keith Fitzsimmons in 1999, with a simple mission statement – “to offer a service providing rapid assessment and treatment and one that is dedicated to the relief of pain and the rehabilitation of the individual”. Specialization: Synergy provide many specialised treatments, for a variety of medical problems, including respiratory care, neurological rehabilitation and work place physiotherapy. Owner/ Director / Founder : Douglas Square is a physiotherapy clinic providing various treatment options to aid Musculoskeletal conditions. Products such as orthotics and bracing are sold at the clinic. The Centre also offers pilates and massage therapy services. Specialization: In just over three years, Douglas Square Physiotherapy Centre has helped more than 1, 800 individuals get back on the road to recovery through physiotherapy, acupuncture, orthotics and massage therapy. With special attention to patient privacy, satisfaction and comfort, Douglas Square works hard at providing a positive environment for both clients and staff. Owner/ Director / Founder : ??? Specialization: City Clinic is a multidisciplinary clinic with therapists covering a number of disciplines including Physiotherapy, Chiropractic, Osteopathy and podiatry. We realise this list is far from complete, so if you’re an ‘award winning clinic’ please get involved and post below – let us know about you!!! Copyright © 2010 Rehab Software Pro. All Rights Reserved.